For the sixth straight year, Northern Virginia residents are providing warmth to Syrian refugees facing a cold winter in refugee camps. The region's annual, month-long blanket and coat drive is underway. WASHINGTON — For the sixth straight year, Northern Virginia residents are providing warmth to Syrian refugees facing a cold winter in refugee camps. The region’s annual, month-long blanket and coat drive is underway. 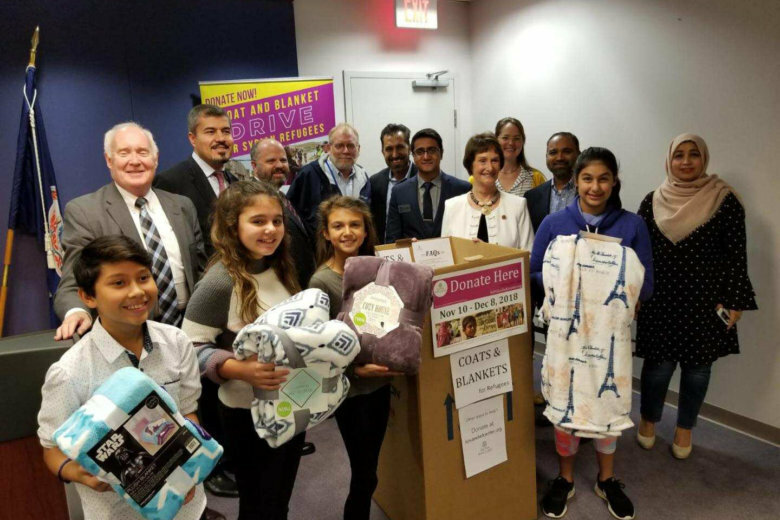 “Over the past few years that we’ve been holding this drive, Northern Virginia has sent over 100,000 blankets and coats to Syrian refugees, abroad,” said Sharon Bulova, chairman of the Fairfax County Board of Supervisors in a Friday news conference Friday. The drive is organized by the NOVA Relief Center, an organization dedicated to improving the quality of life of refugees. Springfield, Virginia-based Paxton Companies transports the donated goods free of charge and Maersk, the world’s largest container shipping company, ships the blankets and coats free of charge. “We want to encourage everybody who can to bring out donations to any of the number of locations,” said Martin Nohe, a member of the Prince William County Board of Supervisors, “Understand that the donations of coats and blankets you make to this drive are going to directly help those individuals who are most in need of help,” he said. There are drop-off locations for lightly used blankets and coats in Fairfax, Loudoun, Arlington and Prince William Counties and in the city of Alexandria. Find the location of your closest drop-off spot on the NOVA Relief Center website. The coat drive ends Dec. 8. The office of the United Nations High Commissioner for Refugees estimates that there are 5.6 million people who have fled Syria since the start of the Syrian Civil War in 2011. Many are seeking safe haven in Lebanon, Turkey and Jordan. Millions more are displaced from their homes inside Syria.